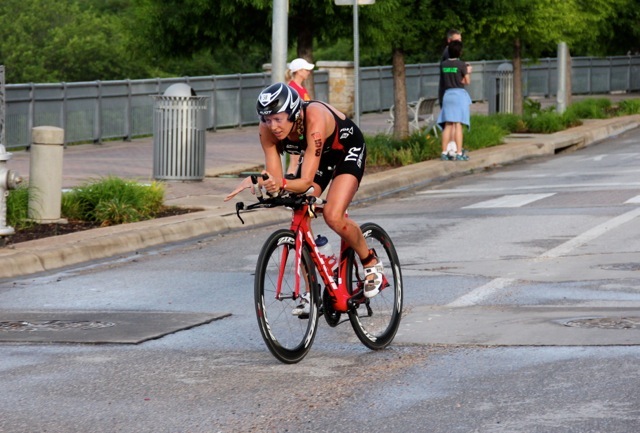 Triathlon is a sport that embodies the spirit of overcoming obstacles and challenges; both mental and physical. 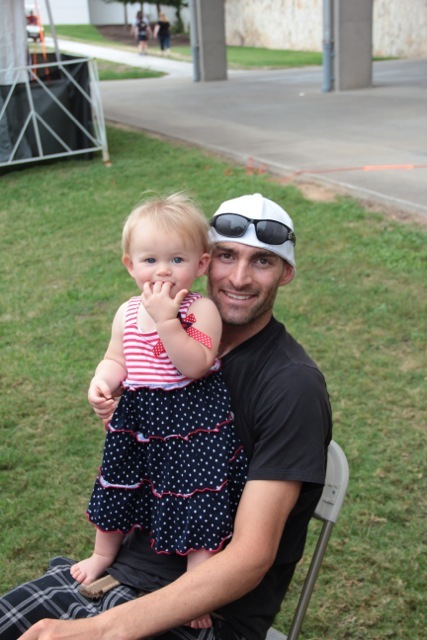 I think this is what makes the sport of triathlon so tough, but also brings so much reward! 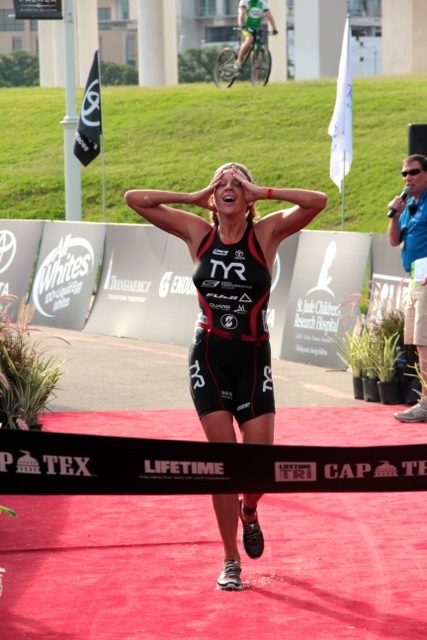 This year, the 2014 Lifetime Fitness CapTexTri race proved to have some tough challenges I was able to overcome. The challenges began with Caroline getting sick a couple of weeks prior to the race and that led to both Nate and I getting a little sick and run down the Thursday before race day. I ended up taking the few days prior to the race easier than normal to rest up and hope that my cold would clear up before race morning. I headed to the race Saturday morning not 100% sure I would be able to get onto the start line, but I stayed positive and hoped I would recover in time. On race morning, I woke up at 4:30am with my lungs feeling much more clear and I knew that I had a chance to give it my all. I had my normal PBJ and honey sandwich and my PowerBar Preform drink. I also heard that garlic had some help in curing chest colds, so I had included full cloves of garlic into my recent diet! Maybe those garlic cloves were paying off, at the expense of Nate’s nose! Nate reminded me to be strong mentally and just give what my body was going to physically give me for the day. I was just happy to get to that start line! Race started at 6:47am, just two minutes behind the men. The roads were soaked from the previous nights storm and there was more rain in the forecast, so I switched to my Zipp 404s with the rain tires and running about 85psi. The race course was changed slightly this year due to some construction. The run and transition area were very different from years past. 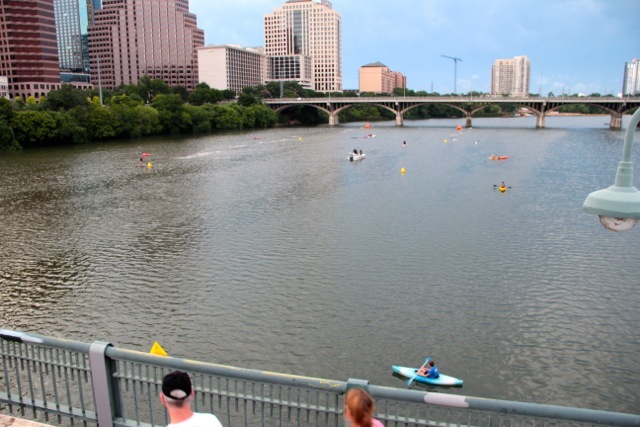 The swim started off in a deep water start and I began at a nice tempo pace. I built into the swim from 4th position at 500 meters into 3rd position. I maintained 3rd position until the swim exit. I managed to stay behind Sara McLarty and Lauren Brandon until the last 100 meters when I lost about five seconds because we caught some guys and they were fighting me for my position. I felt I had a great swim overall, despite a bit of tightness in my chest. After the swim, I put on my Sketchers GoRun3 for the 1k run to transition. I did not want to take the chance to step on a rock during the duration of that run! My legs felt very heavy and tired during the transition run and I feel this was about the toughest part of the race! Once I got on my bike, I pushed hard. This course is like a ITU style course. It consists of four loops that are both hilly and technical. I have a tendency to get very excited when I get on my bike and forget that the roads can be slippery. Half-way through the first lap of the bike, I went down. It was a downhill section, into a hard left turn and my front tire hit paint and skidded right out. I checked out my body, I could get up. For a moment, I thought, “Maybe this day is not meant to be. I have a cold, I crashed, maybe this is a sign I should stop.” I grabbed my water bottle off the road, put it back on my Fuji Norcom Straight and got back up and going again. I wasn’t too sore and I thought to myself that I better keep going and see what happens. It took me about a half a lap to get my rhythm back and shake off the crash. Soon enough, I was back into the race mentally and physically. 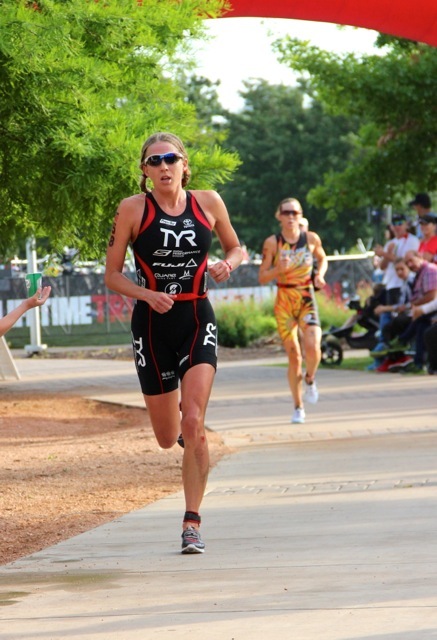 I focused on my race plan and what was going to get me back into the race I stuck with my nutrition plan. I drank all of my Power Bar Perform out of my Speedfil A2 and took in my PowerGel the last lap of the bike. I felt great on the bike, my lungs felt good and I ended up exiting in second place, just a few seconds behind Alicia Kaye. Here is my Quarq Power File brought to you by Trainingpeaks. I headed out on the run with my Skechers Speed2, race belt, and Rudy Project Swifty glasses. 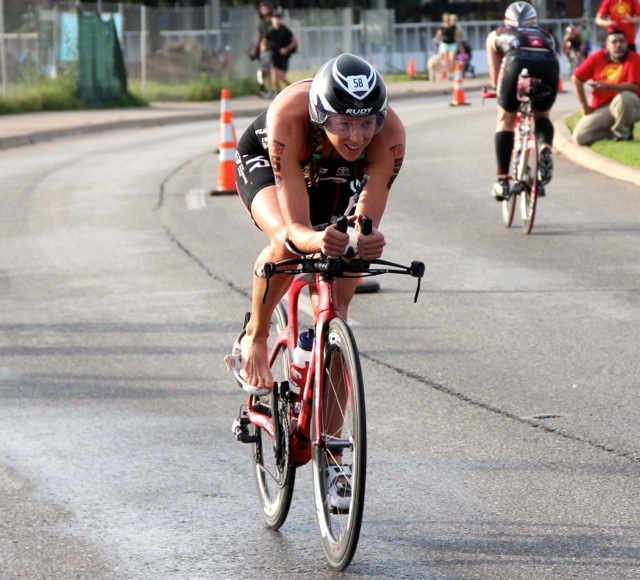 I made up the few Seconds on Alicia Kaye in T2 and was first on the run course. I was not sure how I was going to feel during the duration of the 10k. I was not sure if I would feel any ill effects of the crash or the chest congestion. I started off strong, but at a conservative pace. The run was curvy and twisty and before I knew it, I was almost half way through the run and I was feeling strong! As I was finishing my first loop, a para triathlete was finishing and holding the US flag. This really made me think about what true mental toughness and sacrifice means. All of our men and women who are serving our country and sacrificing so much. It is a day remember all of the the real heroes who have fought for our freedom and the ones who have given their lives so we are able to live our lives in freedom! 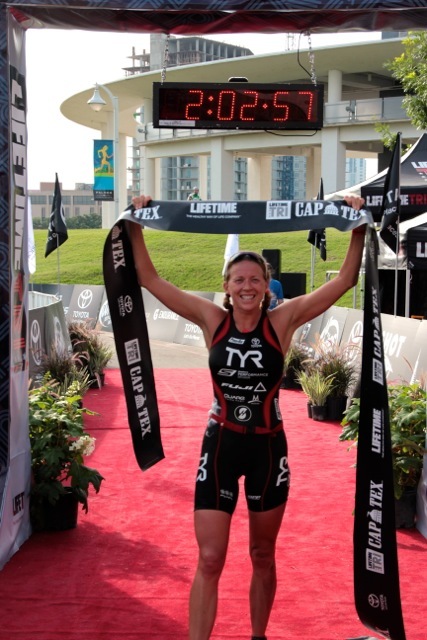 I broke the tape and was more than happy to overcome the obstacles! This was my second win in the Lifetime Series and my fifth for the season. A few days prior I didn’t even know if I would be able to get on the start line. Positivity, faith and trust can take you far. Now it’s back home for a few days to rehab some swelling, bruises and get ready for the next challenge right around the corner, Escape from Alcatraz! I have never competed in this race before and I figured it was the perfect time to head to San Francisco and take on the iconic race course! Thank you to all my sponsors, family, friends and therapists for supporting me and helping me to achieve my goals.